The Clock Made of Confetti by Michael Salcman. Holocaust, to poetry on baseball, Einstein, 20th century American life, and romance, through an eight poem series on Thomas Eakins, the 19th century realist painter, and across an array of poetry tackling the visual arts. The Clock Made of Confetti is a throwback to when a book of poetry signified an author had something edifying to offer. That edification is increasingly rare in American literature says something ominous about society in the age of technology. and broken bottles from the street. Salcman creates pace by breaking the sentence across 10 lines of poetry, and also breaking up grammatical clauses across lines in 3,4,6, and 7. This enjambment makes a reader want to complete the sentence’s thought, and therefore moves the reader down the page. The poem’s opening stanza comes to rest in line 10 with a full clause expressed in the line, creating a sound of rest. A poetic line such as “and Carrier Bailen” would not work in modern imagistic poetry such as in Sylvia Plath’s work, or among sculptural lines such as in John Keats’. Salcman’s lines are more pace-driven, like American poet Philip Levine’s, and his pacing often carries the reader through. Salcman’s free verse also is subtly expert in the passage quoted above, though the craft may seem hidden. The first four lines are slant rhyme couplets, “him” and “tram” / and “Via” and “Bailen.” Lines 5 and 6 follow with a full rhyme in the last syllables of “identification” and “apron,” but then the poem abandons rhyme. At least two lines thereafter end with onomatopoeia in “flecked” and “dotted.” The last two lines are united through alliteration of “s” and “b.” This poem “Old Barcelona,” if criticized for anything, could have further developed its homage to Gaudi. What you see above is what you get. It begs the question, why is Gaudi the famous architect important to Salcman? Salcman clearly considers creators of beauty as heroes. However, as often as not, Salcman elaborates no further. In contrast, Philip Levine’s ode to jazz “Call It Music” in Breath, as well as Salcman’s own mulit-part homage to the painter Thomas Eakins, are homages that are fully-realized self-explorations. 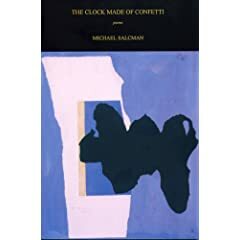 The Clock Made of Confetti overall is an accomplished work, and takes the reader on a journey through scenes from American life, baseball and cities, through appreciations of classical and modern art, through glimpses of Salcman’s family; and to encounters will illness and death, which Salcman treats as a doctor, and also witnesses as an older man. Salcman handles the theme of mortality with a classical dignity and melancholy detachment. His poems can be read slowly to savor their atmosphere, and read for insights derived from contemplation of art that are applied to daily living. The book’s title poem—one of the few without a clear narrative—seems to be saying that the world, like a clock, rushes forward and leaves us with beautiful confetti—“all those blossoms,” writes Salcman. His poems, then, are his confetti. In the poem about the poet and doctor William Carlos Williams delivering Allen Ginsberg, Salcman fictionally places the scene at the Ginsberg home in “Dr. Williams Delivers a Baby,” though Salcman says that Williams really did deliver Ginsberg at a hospital. As Dr. Williams does his rounds, “he’d sit in a car / with a notebook on his lap,” says Salcman. Salcman himself blends a professional vocation with writing advocation, and so we can take this as Salcman’s ars poetica. When Williams delivers the child, Williams puts personal thoughts aside and delivers the child with an intelligence stripped of personalism. The language describing it loses personal attributes: “then he encouraged the head with a gloved hand / turned the shoulders and delivered the rest.” Like these two lines, Salcman’s poetry is very clear-eyed and detailed. Yet unlike a practical doctor’s hands, Salcman’s poetry almost always gazes toward the beautiful. And rearrange the map of your face. These lines, until the final two, lack language or content to make them stand out. In contrast, the first two lines if combined into one would have offered rhythm by creating caesura, internal rhyme, and parallelism: “In kiss after kiss, I displace your lips.” Furthermore, another way to improve this short poem would be to choose one metaphor here, such as “displace” from “displace your lips” in line 2, or “map of your face” in line 8; then the poet develops and threads this metaphor throughout the entire poem. Overall, Salcman’s work in his first foray is excellent. This reader awaits the next salvo. much (not that I told him). for imprecision. He was forty when they wed.
or share his evident disappointment in the future. Gregg Mosson is the author of a book of nature poetry, Season of Flowers and Dust from Goose River Press, and editor of Poems Against War (Wasteland Press), a journal with national contributors. His commentary and poetry have appeared in The Cincinnati Review, The Baltimore Review, The Baltimore Sun, Loch Raven Review, and The Little Patuxent Review. He has an MA from the Johns Hopkins Writing Seminars, and lives and teaches in Maryland. A new book, Questions of Fire, is forthcoming from Plain View Press in Fall 2009. For more, seek www.greggmosson.com.